This is not a book about storytelling in presentations but in, well, advertising. The author argues that in order to stand out these days and really capture your audience, you need to tell stories. But not only your ads should tell stories, your entire brand should be story based. The book starts with the author's own story - as you would expect from a book about stories. After that it flails around a bit - I found some sections hard to read while others just flew by. The author also can't resist to invent a new word (it's one of those books) for the era we're in. He calls it "digitoral", i.e. a combination of digital and oral spreading of messages as opposed to the broadcast era (one sender, many receivers) that came before it. Oh well. The second part of the book is better. In it, the author analyses how stories are structured and what makes them work. I recommend you do the exercises (called "basic training") since they can really help you define your brand message. You don't have to slavishly stick to the exercises - in fact, there's a good chance that you need to deviate a little from them. For example, I couldn't find a good mentor archetype in the provided list of characters; it's missing a mentor whose focus is simplicity. The author certainly has a point. The most successful brands these days are not about their products or services alone but about their entire image. But your customers expect more from that image now; it needs a message or a story behind it. The book is saved by its second part which really gets down to the core concepts behind how and why stories work. The included exercises will help you find the story for your brand, services or products. 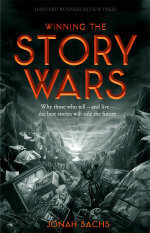 "Mini Book Review: Winning the Story Wars" by Dirk Haun is licensed under a Creative Commons Attribution-ShareAlike 4.0 International Licence.